GNA University organized an FDP on “Getting Started: Research: An Introduction” October 24, 2015. Dr. Govinder Flora, Dean Academics, highlighted the need of research in teaching and learning process. 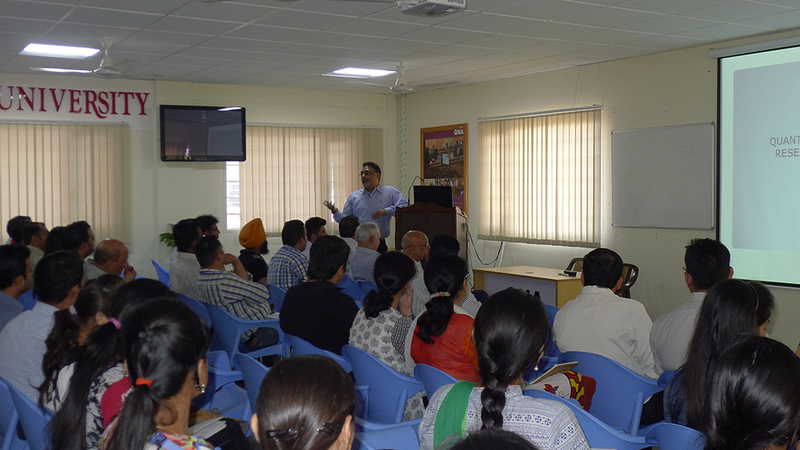 He apprised the faculty members as how they can start with research in their respective areas of interest. He believed that one should take research to get solution to a problem, generation of new knowledge and explanation of new phenomenon. He also explained various types of research viz. fundamental, applied, primary and secondary, that the research process should be deeply taken into consideration bypassing Plagiarism asit leads to withdrawal, reprimand and ineligibility. He emphasized that the best way to begin in the field of research is to undertake some reading. He also threw light on how to seek grants for research. Dr. Prem Kumar, Vice- Chancellor, GNA University emphasized that learning at GU is project oriented and teaching is research oriented by highlighting some of his real life experiences. S Gurdeep Singh, Pro Chancellor strongly announced that GNA University is always ready to fund young researchers in unleashing their research talent.